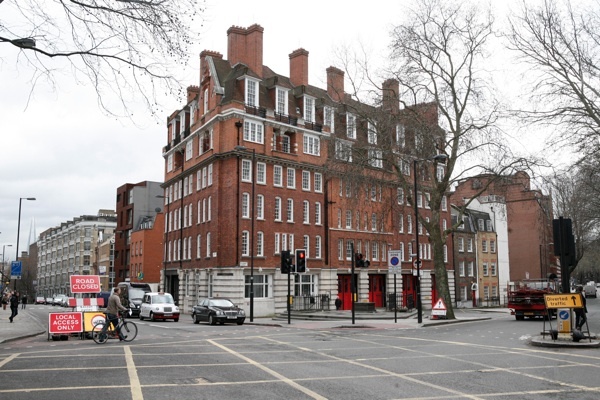 Clerkenwell Fire Station is the oldest operating fire station in Britain, serving the people of London continuously from its handsome red brick tower at the junction of Rosebery Avenue and Farringdon Rd since 1872. Contributing Photographer Colin O’Brien grew up a quarter of a mile from here in Victoria Dwellings, a tenement just down the road at the corner of Clerkenwell Rd and Farringdon Rd, and as a young photographer in the nineteen sixties he leaned out of the window to photograph the Clerkenwell firemen when they came to extinguish a conflagration in his building. 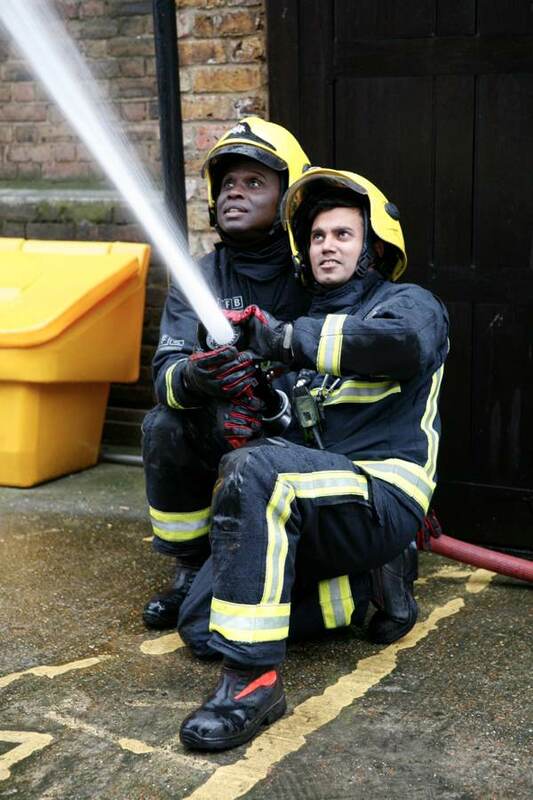 So when I learned that there was a possibility that Clerkenwell Fire Station might shut forever in June, I realised that Colin and I needed to pay a visit upon the firefighters of Clerkenwell, to celebrate these heroic individuals and record their brave endeavours, lest this be the end of their operations here after one hundred and forty years. In spite of the fact that they had all received letters before Christmas inviting them to take voluntary redundancy, we found them in buoyant mood and it was only towards the end of our visit I learnt that several members of the watch had recently received awards for bravery after saving people trapped in a cradle high above the new University College London Hospital in Gower St. 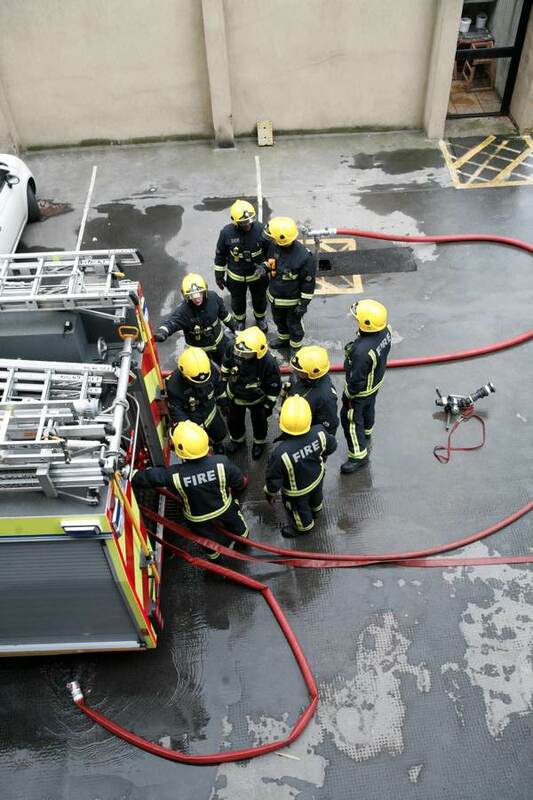 Firefighters work in “watches” of fourteen and there are four watches at Clerkenwell Fire Station who work alternating shifts, two days of 9:30am until 8pm and two days of 8pm until 9:30am, a total of forty-eight working hours each week followed by three days off, thus providing cover every hour, every day of the year. Colin and I had the privilege of being the guests of Tim Dixey’s watch, arriving in the morning to discover the team around the table in the mess, at the end of the days’s briefing before they headed out to the yard to run through the drill that is a constant of life as a firefighter, designed to hone the co-ordination, proficiency and team work of the watch. 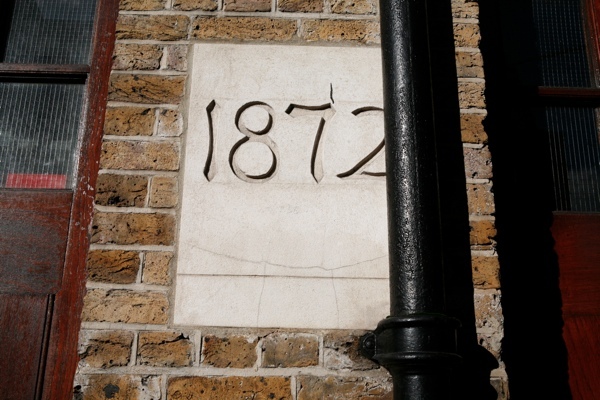 Although the fire station opened in 1872, it is still fully functional and it was a pleasure to see the working parts of the old building cherished – freshly painted, cleaned and maintained in tip-top order, still in daily use for the purpose for which they were built. 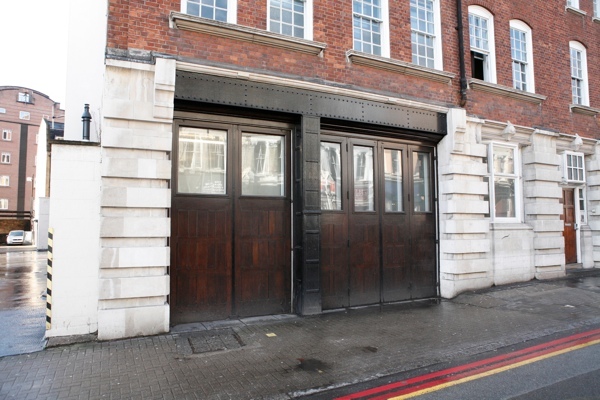 On the Farringdon Rd side of the building are two wooden doors, a narrower one originally used for the hand cart fire engine and a wider one for the horse drawn engine. 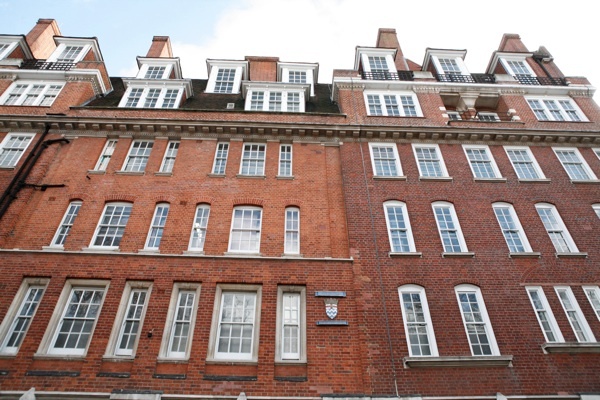 Tim Dixey, a veteran of twenty-nine years in the service who joined at eighteen years old, explained that the founders of the Metropolitan Fire Brigade in 1866 came from a naval background and every station was designed to be sufficient to itself. “They were conceived as ships on land,” he told us. 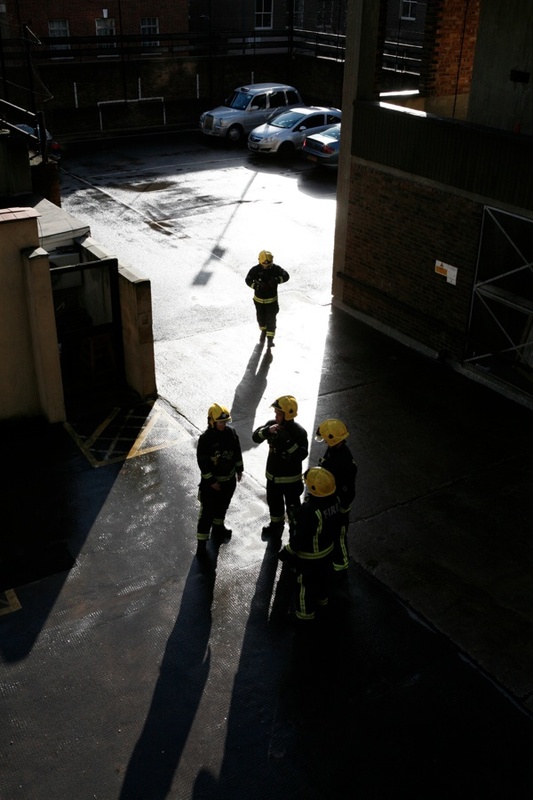 Many of the early firefighters were ex-naval men who were comfortable with heights and familiar with ropework, introducing the structure of shifts and terminology of “watches” that is still used in the fire service today. Meeting the firefighters of Tim’s watch for the first time, Colin and I were touched by the generosity of spirit and emotional openness with which they accepted our presence. I recognised the depth of trust necessary between those who risk their lives in the course of their work and must depend upon each other absolutely. 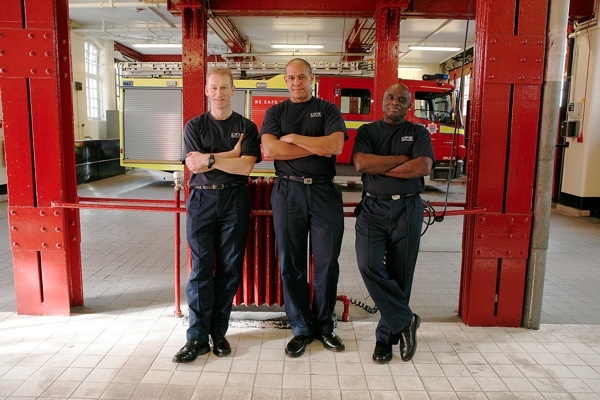 We were surprised to meet a father and son, Andy Simkins and Dave Smith, working together as firefighters in the same watch, yet it only served to enforce the sense of intimate reliance among the crew. At Tim’s request, firefighter Gregg Edwards took us on a tour of the upper floors of the station which have been disused for decades. 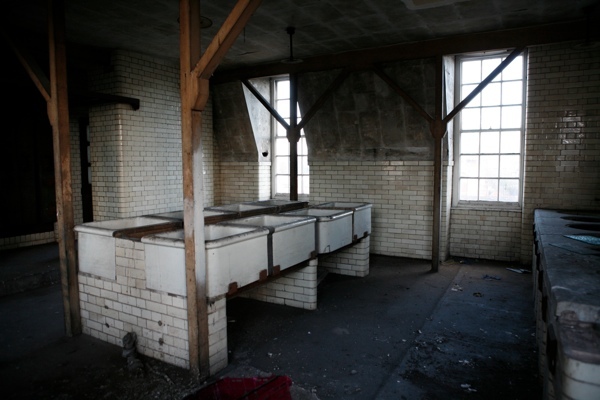 With views across the rooftops to the City, we found the washrooms of the eighteen seventies with huge white sinks lined up for the firemen of a century ago to wash the soot off their faces. In the next room, an elaborate series of metal racks offered arcane facilities for drying wet uniforms in a heated chamber. Walking through another door, we entered the former accommodation of firefighters under the eaves. There were neat delft tied fireplaces and rooms still lined with faded nursery wallpaper. Abandoned in the middle of the last century, when the firefighters sought a degree of independence from their employers, these flats are now designated “unfit for purpose” even though with a modicum of repairs they could be a boon to the firefighters of today, who are unable to afford housing locally and must commute long distances as a consequence. 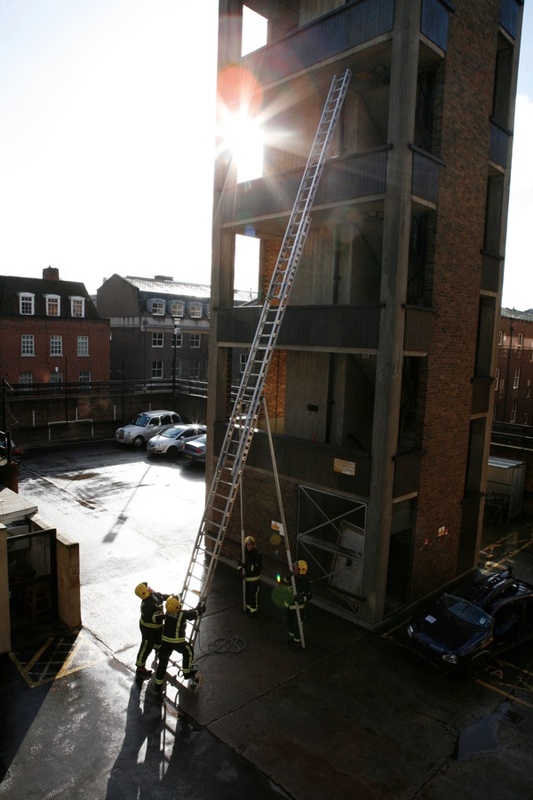 Then we had the opportunity to watch the fire drill as the watch in their yellow and black overalls, swarming like bumble bees, slid the tall aluminium ladder off the engine, extending it to the highest extremity of the tower. 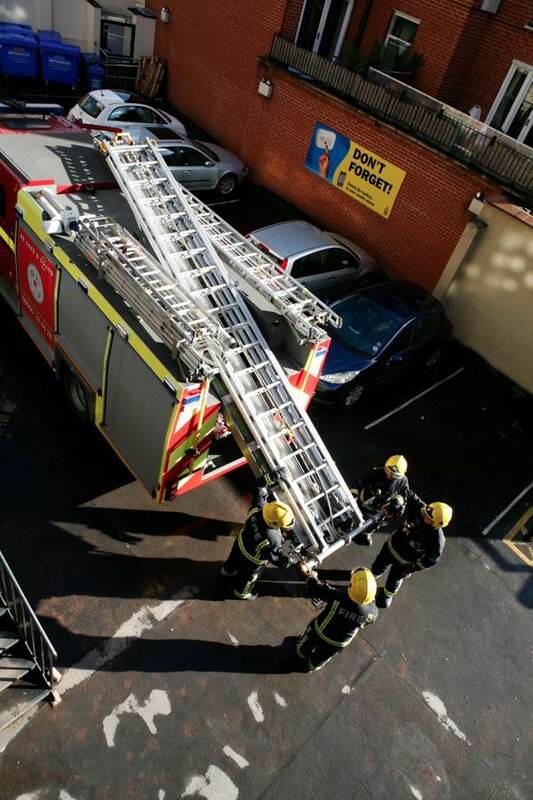 We asked some obvious questions, about the whether the fireman’s lift is still practised and enquired about the frequency of cats stuck in trees. “You’re not supposed to carry people down ladders,” we were told, “But, if it needs that, we will.” We learnt that rescuing felines did not take up a great deal of the fightfighters’ time. “How many skeletons of cats do you see in trees?” quipped Dave Smith, speaking with authority after twenty years in the service. And then a call came in. 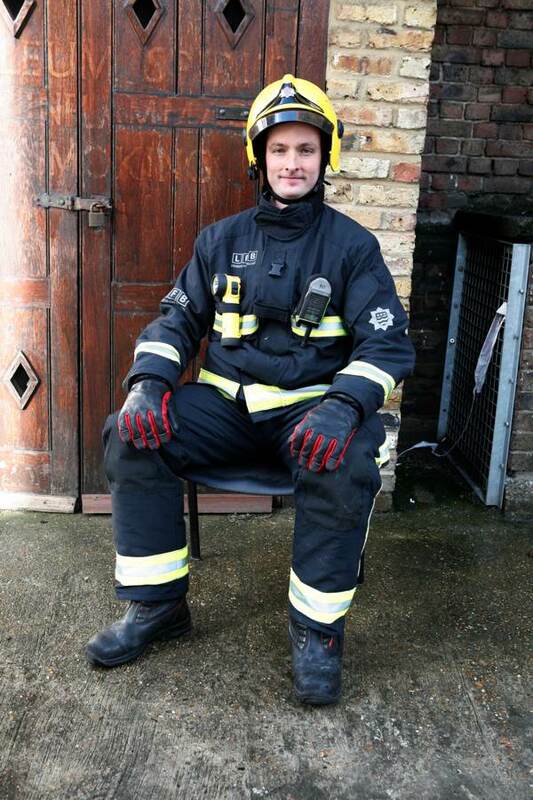 Tim Dixey waved a slip of paper that reported a mother who had locked herself out of her flat when the wind blew her front door shut, trapping her baby inside.“We all go and we don’t leave anyone behind,” Tim joked, introducing a personal tenet, as he and his fellow firefighters climbed aboard their engine. In a moment, the truck turned into the Farringdon Rd, disappearing into the traffic as the siren faded into the distance, and Colin and I were left standing. 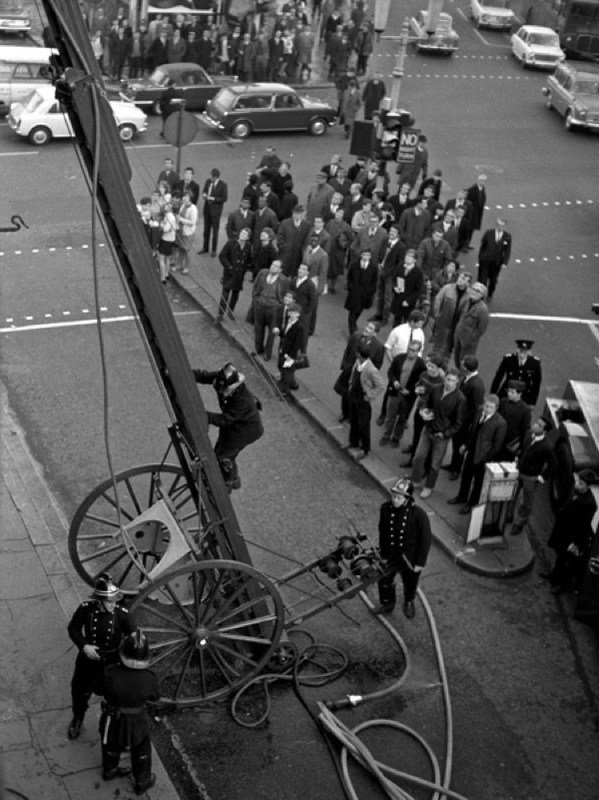 Colin O’Brien’s photograph of firemen at Victoria Dwellings in the nineteen sixties. Tower used for firefighting exercises and as a lookout. 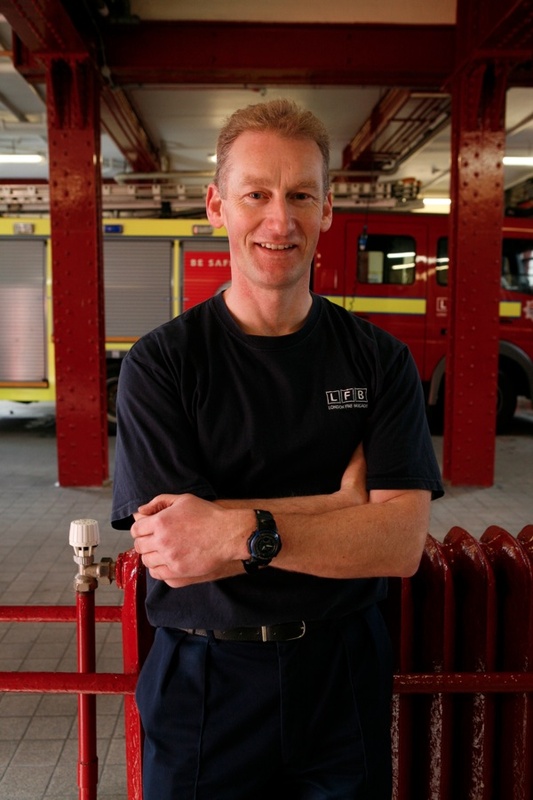 Firefighter Craig Wellock, six years in the fire service. In 1872, the door on the left was for the handcart fire engine and the door on the right for the horse-drawn fire engine. 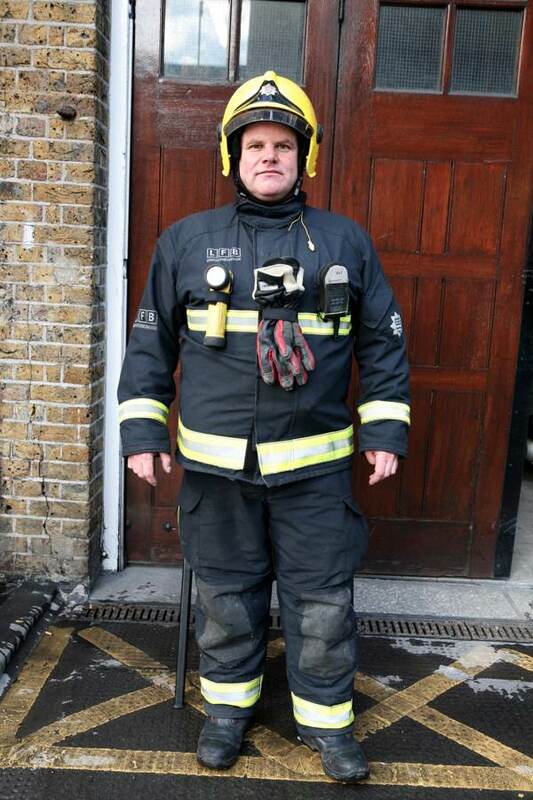 Firefighter Dave Smith, twenty years in the fire service. 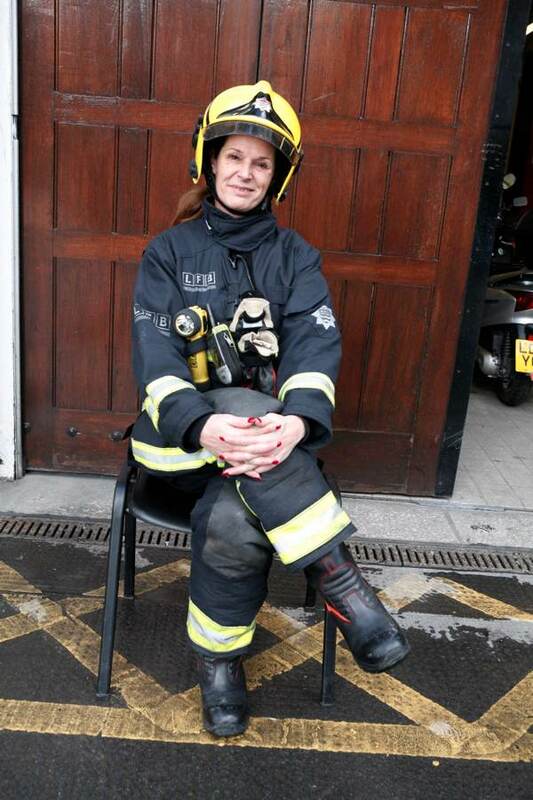 Firefighter Mandy Watts, thirteen years in the fire service. Wash room from 1872, used by firefighters on their return from duty. 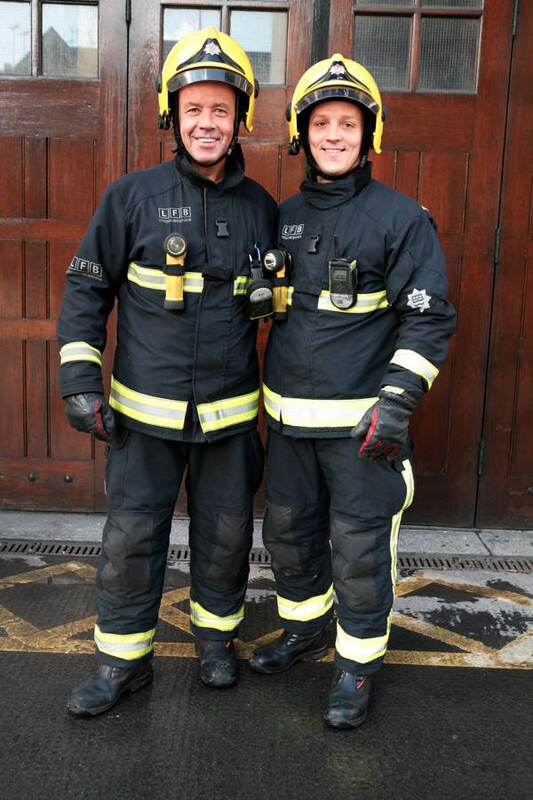 Father and son firefighters, Andy Simkins and Dave White – twenty-six years and six years in the fire service respectively. 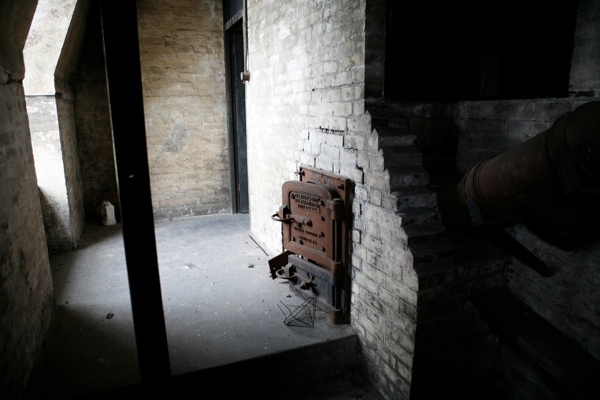 Disused furnace to heat the drying room for wet uniforms, dating from 1872. Firefighters Gregg Edwards, Merrick Josephs and Henry Ayanful. 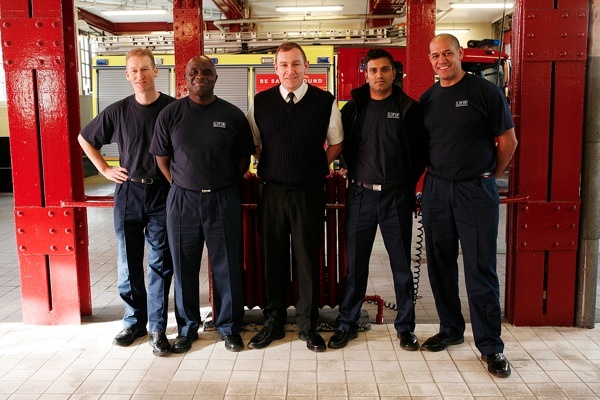 Firefighters Gregg Edwards, Henry Ayanful, Watch Manager Tim Dixey, Firefighters Nasir Jilani and Merrick Josephs. The change in the brickwork indicates where the station was expanded in the eighteen eighties. 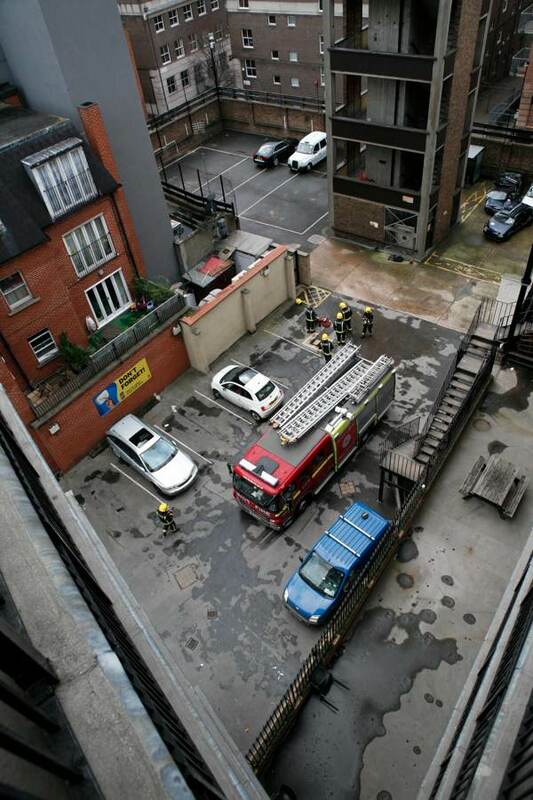 The view from the accommodation floor where firefighters once lived with their families. 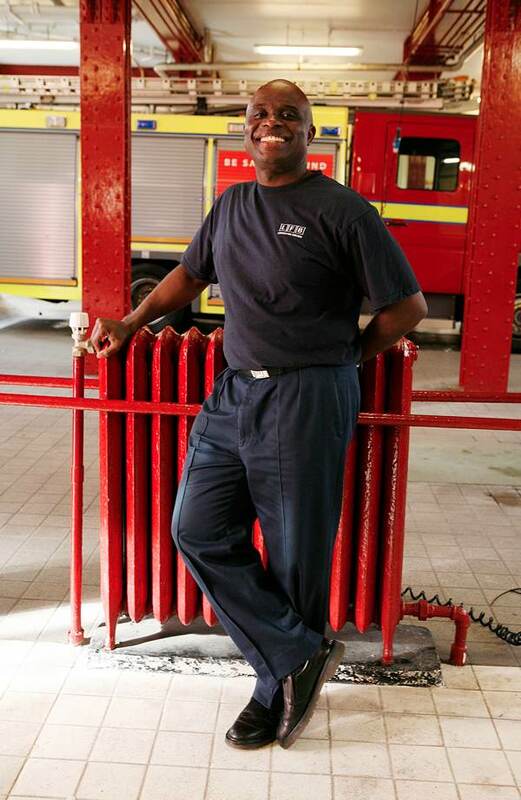 Firefighter Henry Ayanful, twenty-one years in the fire service. 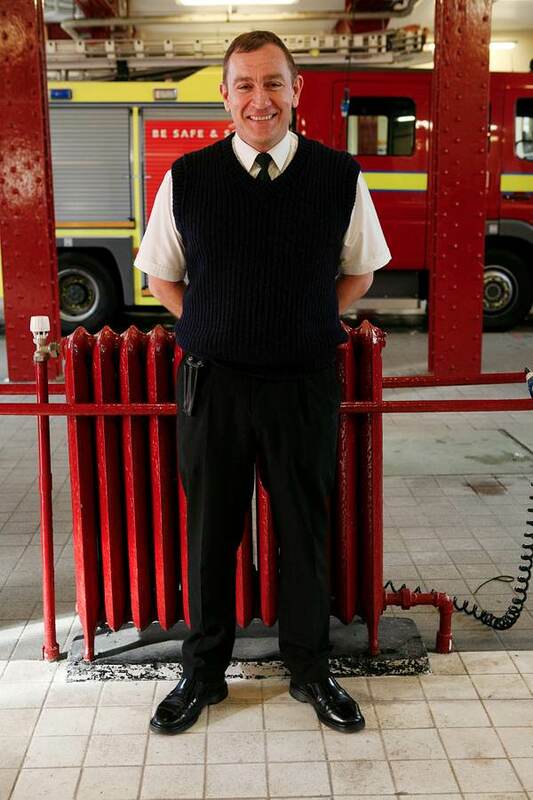 Station Manager Steve Gray, twenty-five years in the fire service. 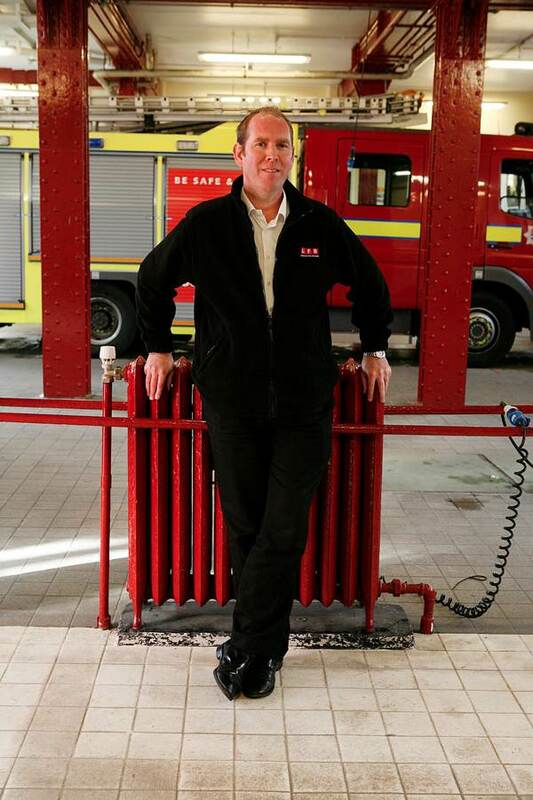 Watch Manager Tim Dixey – twenty-nine years in the fire service, joined at the age of eighteen. 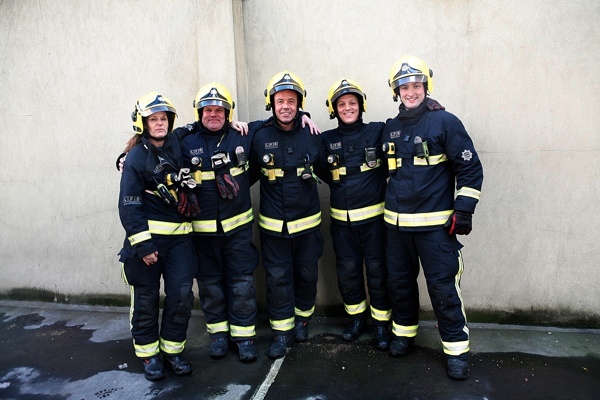 Firefighters Mandy Watts, Dave Smith, Andy Simkins, Dave White and Craig Wellock. 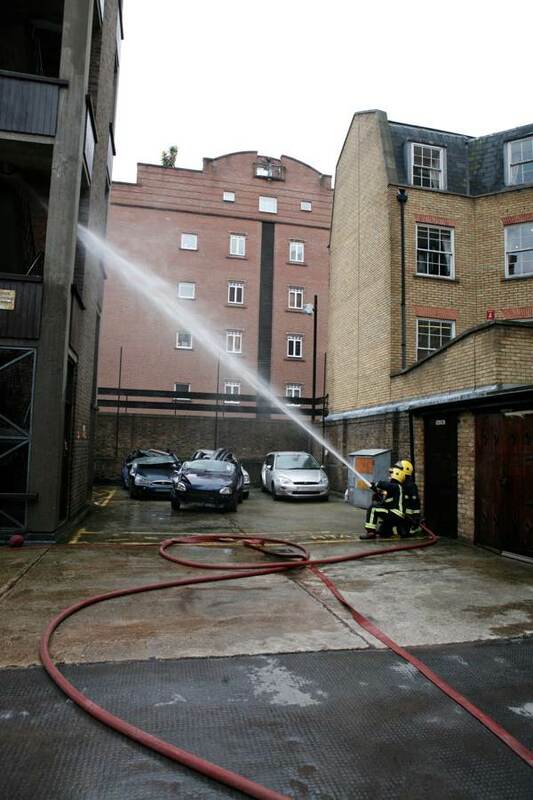 Clerkenwell Fire Station, Europe’s oldest operating fire station. Bankers greed and ever increasing shareholder profit margins should not result in cuts to vital public services. This station needs to stay open – it is a no brainier! Another wonderful article. Hats off to the men and women who service to protect! 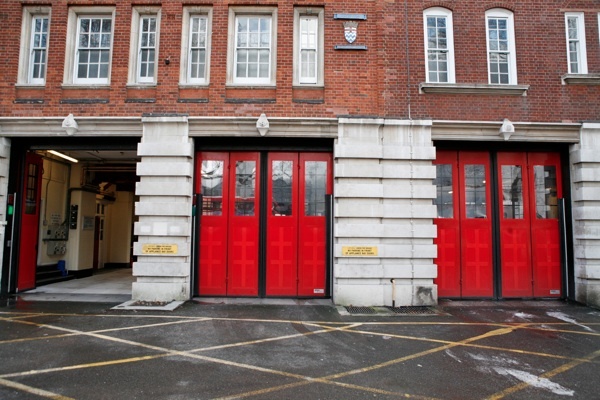 As the City of London has only one fire station, Clerkenwell must be one of the stations which will offer reinforcements in the event of any large scale incident. 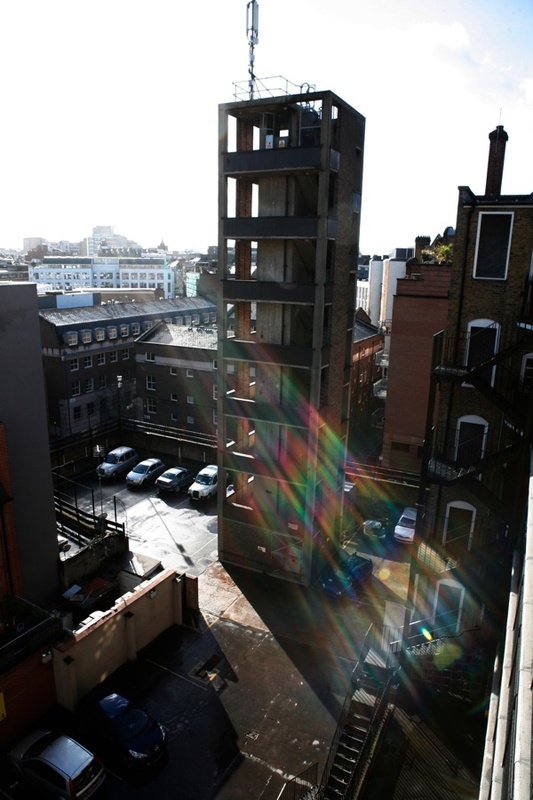 Closing it is madness, but I fear the Gentle Author has shown us the ulterior motive – the building is in a prime spot, and its upper floors ripe for conversion. Shame on these venal politicians. It’s a sad and sobering thing to put a price tag on safety. 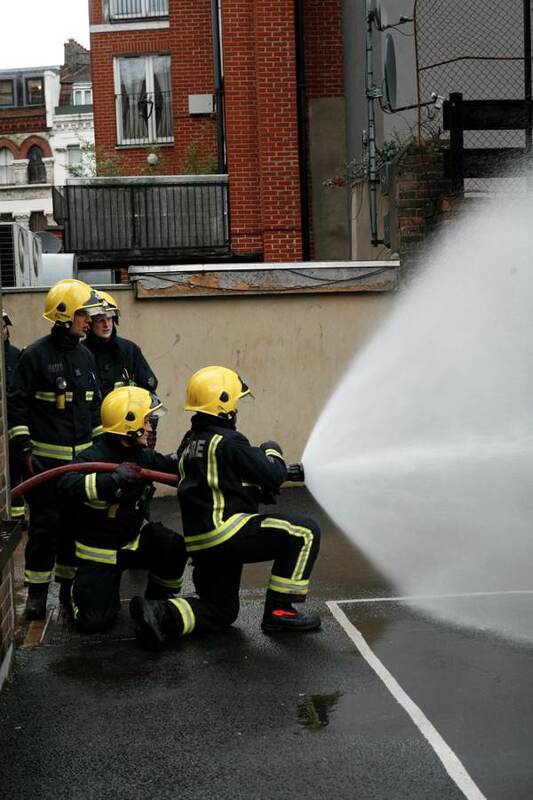 Meeting the needs of a city the size of London is a huge challenge, one that requires excellent personnel, training, equipment, and a base to work from. Before these intended closures happen, I hope due diligence is done by way of studies to decipher exactly what safety impact they will have. Saving money is always brought up in these instances, has any consideration been given to what will happen to insurance rates if these Fire Stations close? A city is an investment which needs to be protected and any cost saving measures should be looked at in the long term; not as a quick way to generate extra income. 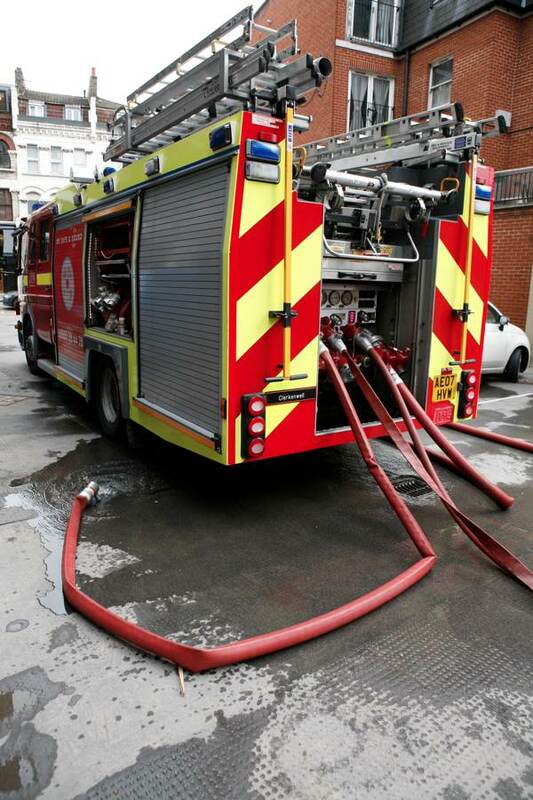 I feel sick to the heart that the closure of this important fire station is even contemplated. How can it be done without consultation? Where are the Health & Safety people when we need them? There is NO argument for closure. 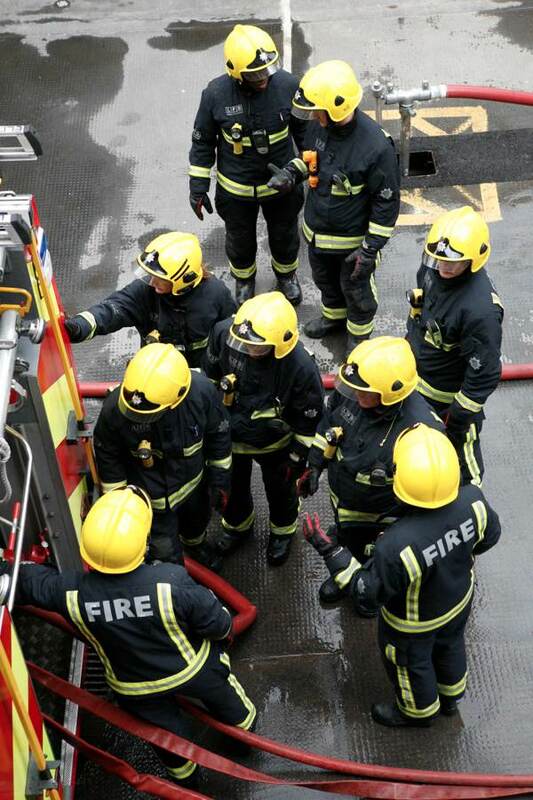 These are our first responders, we should cherish them – and in fact most of us do. We have venal people in power, who do not represent the majority of us at all. The wonderful people in the photos, the gentle essayist and the splendid documentary photographer provide SUCH a fine contrast. 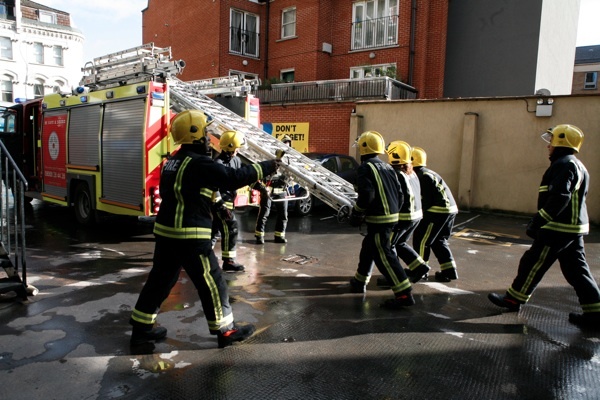 There is a demonstration in support of the London Fire Service on June 8th 2013 starting at Highbury Fields at 1pm and ending at Spa Fields just around the corner from the Fire Station. Readers – please join in!